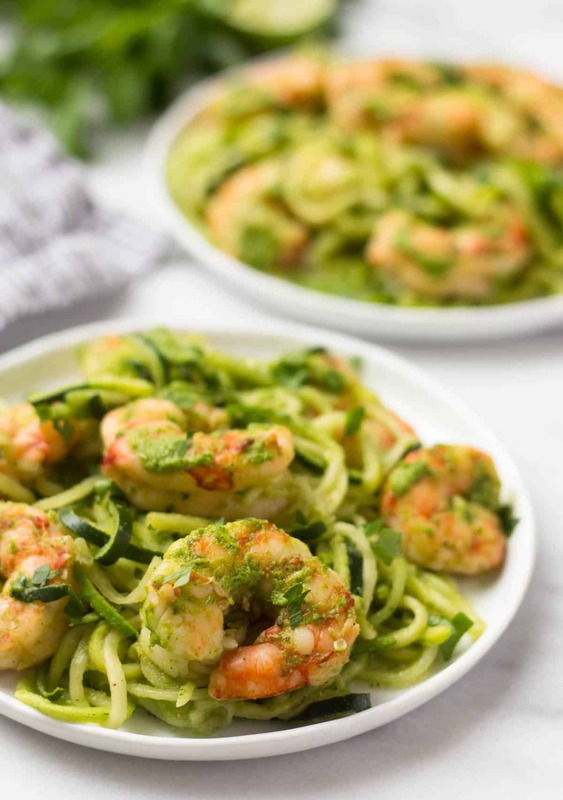 10 minutes + one pan is all you need for these Spicy Chimichurri Shrimp Zucchini Noodles! 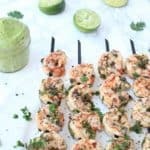 The easiest paleo, Whole30, and gluten free dinner for summer! This recipe first appeared on Instagram in partnership with Veggie Noodle Co. Happy Thursday! Thank goodness for the short week. I hope everyone enjoyed some time off and did something they wanted to do. We really really really wanted to head back east to my family’s beach house for the long weekend, but ended up sticking around Austin. We couldn’t find a cheap enough flight to really make it worth it. It’s kinda weird not being at the beach for July 4th, but we still had fun. Saturday we just did some errands and hung out around the house. Sunday went to the farmers market, hit up the pool, went out to dinner and drinks, and hung out with our friends. Monday was a waste as I was a little hungover from Sunday (when will I learn) and then Tuesday we had a BBQ at our CrossFit, went to our friend’s pool party, and then hung out with some more friends. Overall a successful long weekend. I wasn’t planning on getting crazy this weekend, but ended up drinking a decent amount of alcohol on Sunday. 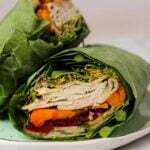 So I’m bringing you a easy and light meal to get ya back on track. I shared this recipe on Instagram a few weeks ago and figured it was time to put it up here for everyone else to see. I have made this spicy chimichurri before and it’s so good I wanted to put it to good use. 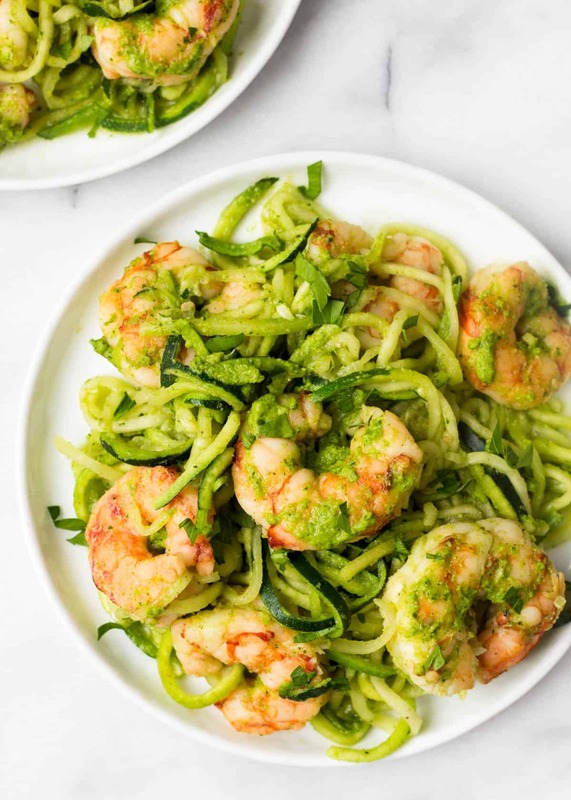 Zucchinis are in season right now and spiralizing (I have this spiralizer) them into noodles makes the perfect light summer meal. 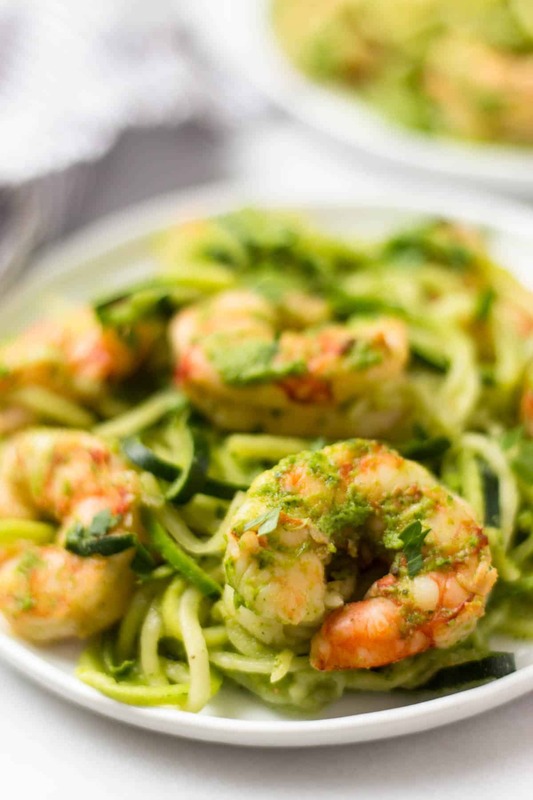 I used premade zucchini spirals from Veggie Noodle Co. to make the process even faster. 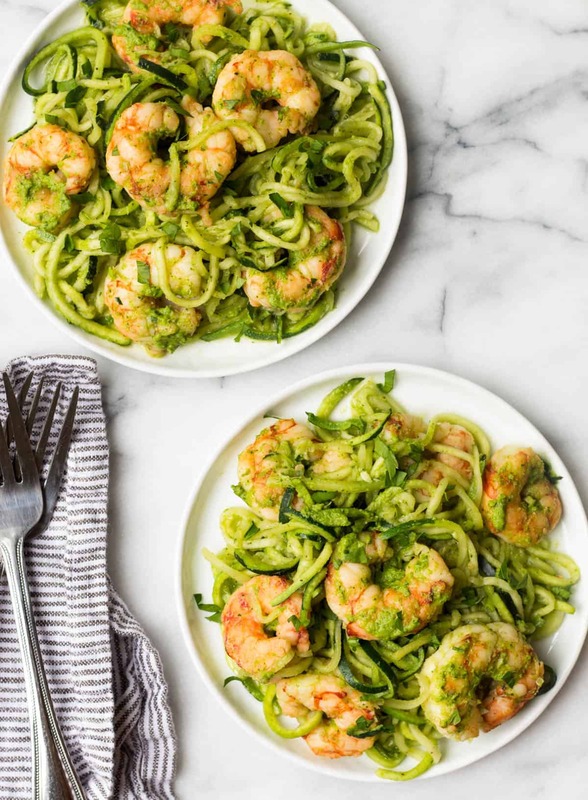 These shrimp zucchini noodles take only about 10 minutes to make and only calls for 1 pan (plus a blender to make the sauce). Yay for less dishes and more time for doing things you want to be doing! Make the sauce. Place all the sauce ingredients into a Vitamix or high powdered blender and blend until smooth. Heat a large non-stick pan over medium heat and spray with olive oil. Once hot (about 30 seconds), add shrimp and let cook for 2-3 minutes on one side. Flip them over and cook for another minute until white and firm. Turn heat to low and add zucchini noodles, garlic powder, and salt and pepper. Stir to combine and cook for 1-2 minutes, depending on preference. Turn off heat and mix in as much spicy chimichurri as you like. Garnish with fresh parsley and enjoy! This recipe first appeared on Instagram in partnership with Veggie Noodle Co. This post is not sponsored or endorsed by Veggie Noodle Co. All opinions (as always) are my own. Fourth of July BBQ’s are so fun! One of my favorite parts at the BBQ we went to this year was one person reciting Patrick Henry’s famous speech. Oh my gosh, that sounds so cool! What a fun way to celebrate! 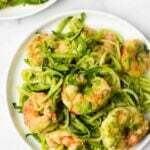 And you will love the spiralizer! 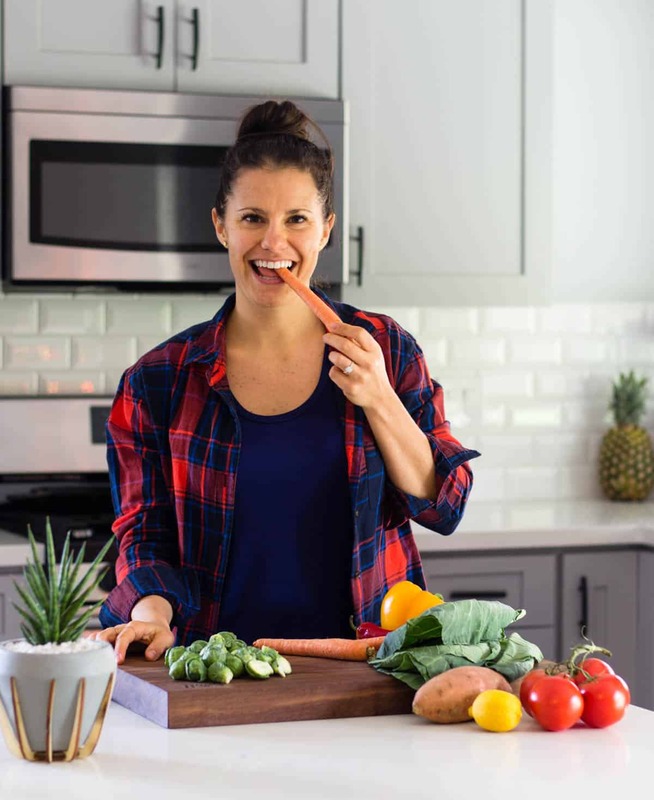 It’s so fun turning veggies into noodles and you can get so creative with recipes. 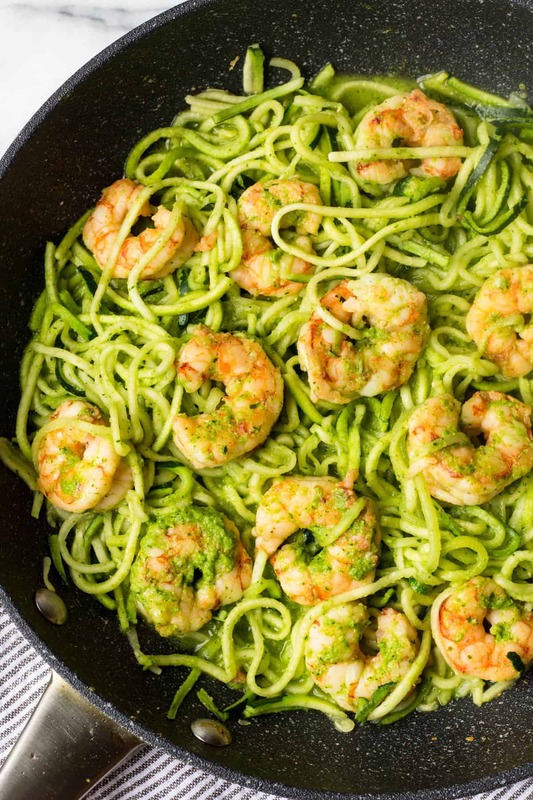 Thanks for sharing this shrimp zucchini noodles. My family loves noodles. I would try this recipe out. Let me know how you like it Lara!